Fayette County Chamber of Commerce President Julie Bolender thanked guests for attending and sponsors/investors for the event and the Chamber of Commerce. The crowd enjoyed a breakfast of fruit, biscuits and gravy, sausage links, ham, cinnamon rolls and more. Timothy McDermott — who serves as regional business consultant for the Ohio Bureau of Workers’ Compensation — took time to address the crowd Friday morning. Nick Epifano, owner/operator of the McDonald’s of Fayette County, introduced both speakers to the crowd. Former Ohio FFA president Ryan Matthews spoke about his time in the program and how it has shaped his career and future. The keynote speaker Shawn Harper presented a message on ripping the script to success and shifting mentality to a “winning” one. The Fayette County Chamber of Commerce — with corporate sponsor McDonald’s of Fayette County — held the seventh annual Groundhog Day Breakfast at the Mahan Building on the Fayette County fairgrounds on Friday morning. Pictured (L to R): Former Ohio FFA president Ryan Matthews, former NFL player and owner/CEO of American Services and Protection Shawn Harper, owner/operator of the McDonald’s of Fayette County Nick Epifano and Fayette County Chamber of Commerce President Julie Bolender. 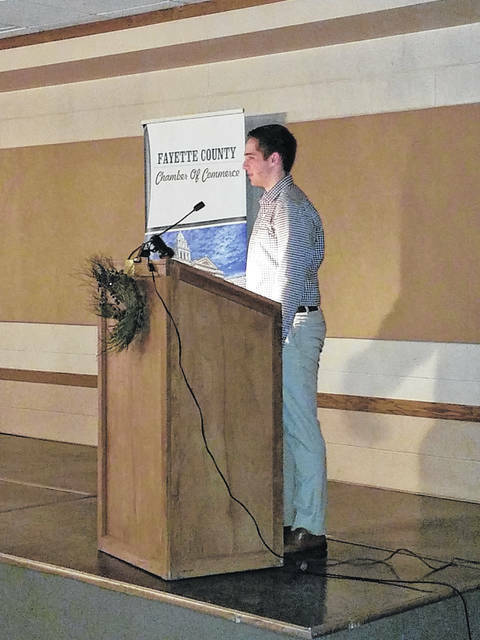 The Fayette County Chamber of Commerce — in conjunction with corporate sponsor McDonald’s of Fayette County — held the seventh-annual Groundhog Day Breakfast on Friday morning at the Mahan Building on the Fayette County fairgrounds. Despite several inches of snow accumulation overnight, a large crowd gathered for an early breakfast at the annual event. Due to the weather, the event was slightly delayed but delivered a delicious meal and powerful speakers throughout the morning. Bolender continued by thanking the sponsors and organizations that assisted with the event. Among the businesses and organizations that sponsored the event or tables, Bolender thanked the Fayette County Agricultural Society, McDonald’s of Fayette County, the Fayette County Farm Bureau, Ohio’s Hospice of Fayette County, Walmart DC #7012, Miami Trace Local Schools, Washington Court House City Schools and Great Oaks. Bolender also named and thanked the corporate investors, including “Platinum investors” Fifth Third Bank, Tony’s Welding & Fabrication, Huntington, YUSA, Valero, Merchant’s National Bank, Parrett Insurance Agency, McKesson, Fayette County Memorial Hospital, First State Bank and the City of Washington Court House; “Gold investor” W and W Dry Cleaning & Laundry; and “Silver investors” St. Catherine’s Manor, Beford Ford Lincoln, Court House Manor, LCNB National Bank and Southern State Community College. Following a prayer by Tony Garren — pastor at Fayette Bible Church — and breakfast, the first speaker, Timothy McDermott, took to the podium. 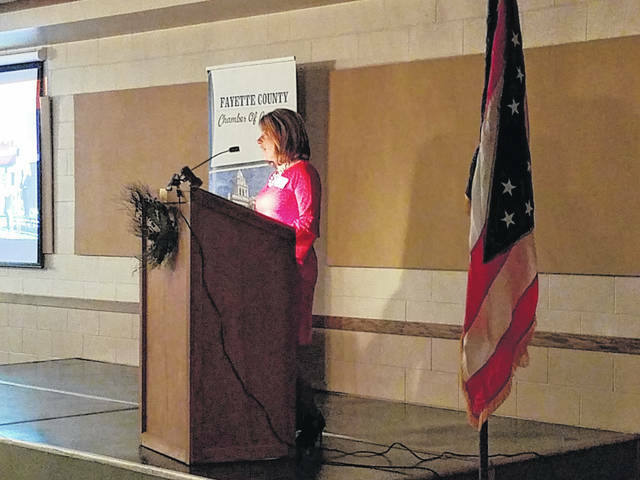 McDermott — who serves as regional business consultant for the Ohio Bureau of Workers’ Compensation — talked about their efforts to save businesses money among many other topics. He spoke on the history of the organization and broke down roughly $10 billion in returns to Ohio businesses. The second speaker, former Ohio FFA president Ryan Matthews, spoke about his time in the program and how it has shaped his career and future. Following trips to Washington D.C. and South Africa, Matthews talked about the impact of agriculture around the world. He emphasized how important agriculture — as well as farmers — are to the globe as they will be the ones to “feed this hungry world.” Finally, he said once everyone starts to find this appreciation, the world would be surprised where it finds itself. Finally, the keynote speaker Shawn Harper took to the stage with his rags-to-riches story. After seven years in the NFL, Harper is now a husband, father and owner/CEO of American Services and Protection; a multi-million-dollar security guard and protection firm in Columbus. This is thanks to Harper “ripping the script” on success and shifting his mentality to a “winning” mindset. Harper continued by explaining his young life in a broken home and how he was labeled “disabled” with learning disabilities, which even resulted in his early education problems such as having to repeat the first grade. He said throughout his life it became an expectation that he wouldn’t amount to much, and the mindset wore on him and started to become how he thought of himself. Referencing a story about a girl and a father at the zoo, the girl wondered how a 12,000 pound elephant could be held by a small, dinky chain on his foot. The father explains that from a young age, its trainers had it shackled and taught it that it can’t escape that chain. Harper proceeded to pull a chain from a bag on the stage. “I was told Shawn, you’re stupid (Harper shook the chain), I was told Shawn, you’re dumb (Harper shook the chain), I was told Shawn, you’ll never amount to anything (Harper shook the chain),” Harper said. Harper wanted to change these perceptions and he worked even harder to do so. Whether it was running exercises to increase his physical prowess or spending extra time in the classroom to graduate early, Harper gave it his all. This included writing a letter that he copied and signed 200 times to send to 200 different schools. Harper said he didn’t just play his second year, he was first-team all-region, included in the junior college hall of fame and received a full scholarship to Indiana University. He went on to be the third pick in the fourth round of the NFL draft, and following his career, he went on to run American Services and Protection, which he has now been doing for around 17 years. To conclude, Bolender took to the podium to thank everyone for attending the breakfast and announced Bev Mullen as this year’s “Celebrity Guest Groundhog.” Unfortunately due to the weather, Mullen was unable to attend. 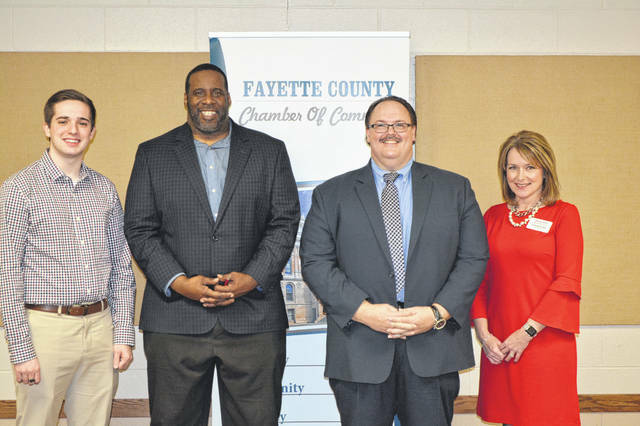 https://www.recordherald.com/wp-content/uploads/sites/27/2019/02/web1_20190201_072024.jpgFayette County Chamber of Commerce President Julie Bolender thanked guests for attending and sponsors/investors for the event and the Chamber of Commerce. 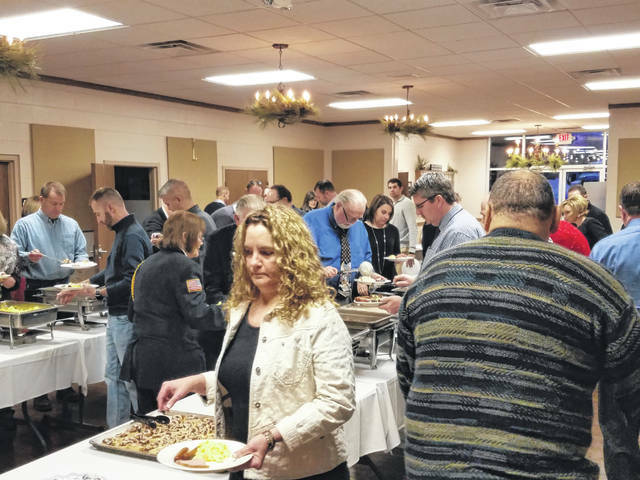 https://www.recordherald.com/wp-content/uploads/sites/27/2019/02/web1_20190201_073026.jpgThe crowd enjoyed a breakfast of fruit, biscuits and gravy, sausage links, ham, cinnamon rolls and more. 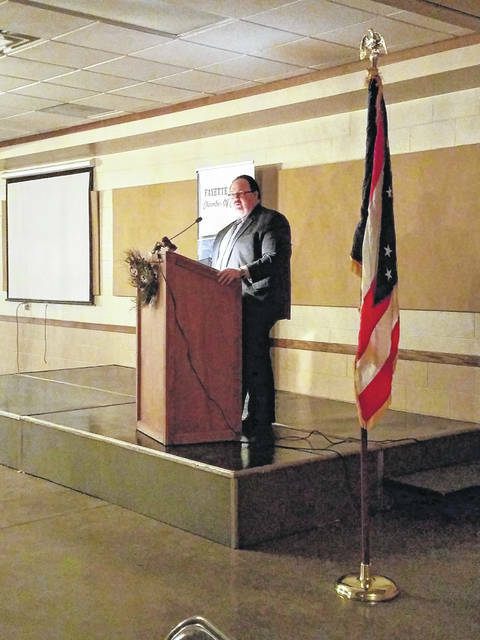 https://www.recordherald.com/wp-content/uploads/sites/27/2019/02/web1_20190201_080018.jpgTimothy McDermott — who serves as regional business consultant for the Ohio Bureau of Workers’ Compensation — took time to address the crowd Friday morning. 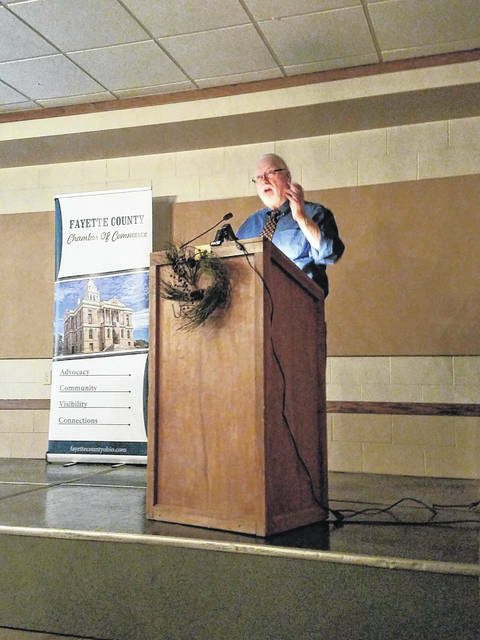 https://www.recordherald.com/wp-content/uploads/sites/27/2019/02/web1_20190201_081333.jpgNick Epifano, owner/operator of the McDonald’s of Fayette County, introduced both speakers to the crowd. https://www.recordherald.com/wp-content/uploads/sites/27/2019/02/web1_20190201_081855.jpgFormer Ohio FFA president Ryan Matthews spoke about his time in the program and how it has shaped his career and future. 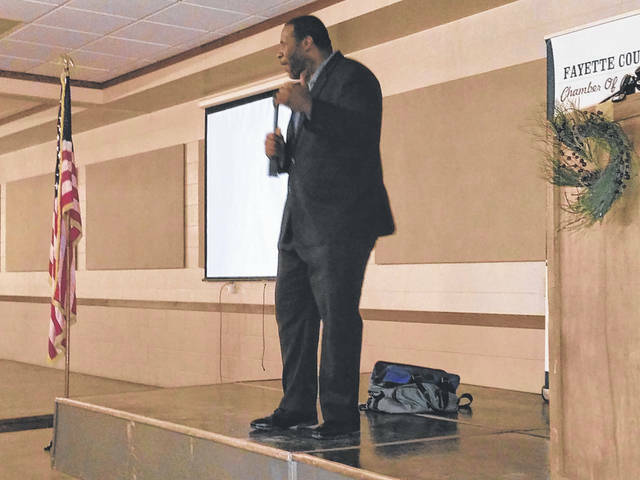 https://www.recordherald.com/wp-content/uploads/sites/27/2019/02/web1_20190201_082921.jpgThe keynote speaker Shawn Harper presented a message on ripping the script to success and shifting mentality to a “winning” one.